Villa Bianca in Seymour is one of the wedding venues located in close proximity to Danbury, Ct. As a wedding photographer, I frequently travel to many venues in the surrounding areas. Most of my clients are from the state of Connecticut but others are from Westchester, NY as well as the whole Tri-State area. I also have a few clients from Europe and will soon be shooting my first European wedding! I am very excited to add European couples' images to my portfolio. 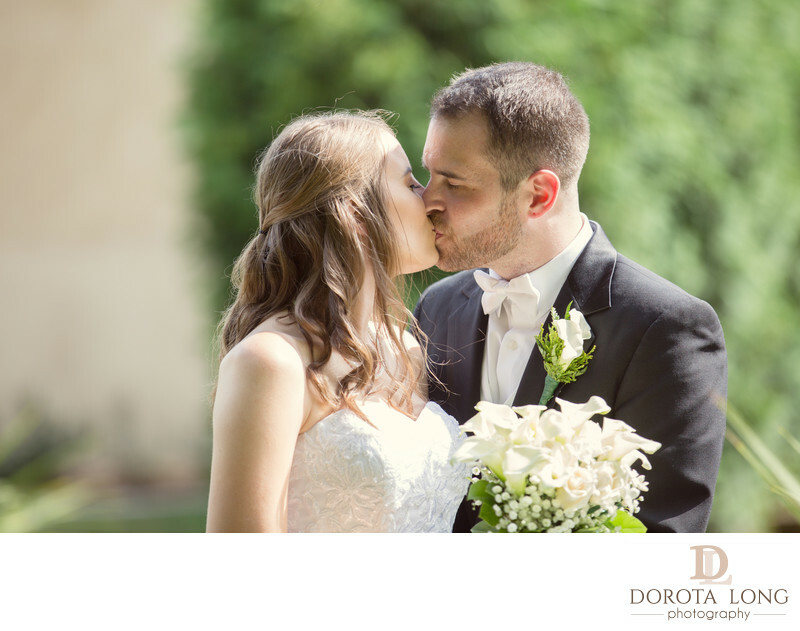 My clients are of different ages and background and what I really love about wedding photography is that I get to document love and connection between two people. I am part of their life on that very day and I capture images that they will look at for the rest of their lives. I feel wedding photography is special and of utmost importance. I take it very seriously. In this image and asked the couple to just kiss. I love it because, even though the light was not perfect, it was early afternoon and the sun was very strong as usual in the middle of the day in July, I was able to avoid harsh shadows and strong light by carefully choosing the position they were standing. The image has a very light and lovely tone to it and my clients loved it!